Custom Kitchens and Bathrooms custom build and install closets, wardrobes, and storage units into homes throughout Wellington. Many of Wellington's old villas and cottages were built prior to the conception of designing and building closets and storage cupboards directly into ordinary family homes. This can often be a major inconvenience to home owners requiring storage space - whether airing cupboards, bedroom closets, or a place to tidy away appliances - and the bric-a-brac of day to day living. Over the years we have custom built many such storage areas for specific purposes in rooms all around the home. 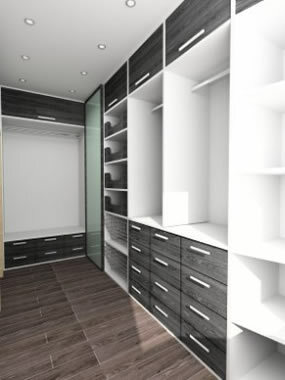 We build cupboards, closets, wardrobes, and storage units to reflect the style and period of your home – or we can put a modern spin on our joinery to suit your tastes and requirements.